Hello! Welcome to the morning of Jaded Blossom's October Release. 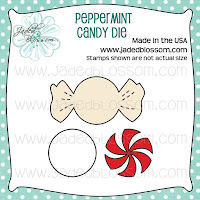 Today we have one more stamp set, Holiday Origami and Peppermint Die. I decorated a tag for a Candy Cane tube with the new Pepermint Die and a sentiment form the New Noel stamp set that was previewed earlier this week. 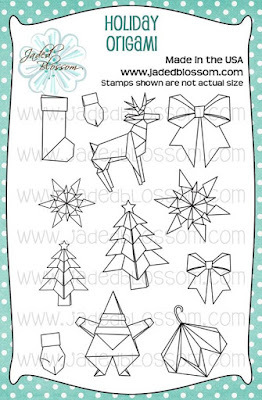 Visit Jaded Blossom to see more projects created with the new October Release. Join the team later today for the Jaded Blossom October Blog Hop at 4 pm PST. Great tag!! I love the little pops of bling! Your tag is wonderful. Thank you for sharing all your projects with us this week. There were wonderful! !